Anthony Fisher Burcher was born in Vaucluse in Sydney, Australia on 15 March 1922, the fifth of the twelve children of Harvey and Estelle Burcher. He worked as a wool sorter before volunteering for the RAAF. He arrived in England in September 1941 and after further training was posted to 106 Squadron. His first operation was the Thousand Bomber raid on 1 June 1942 when he attacked Essen in the crew of Wrt Off Peter Merrals. He went on to join Sgt James Cassels’s crew where he completed a full tour in November. Burcher was a complicated character and although he was at one point put onto a ‘dry’ stint by his CO Guy Gibson for scrapping in the mess, Gibson obviously respected his gunnery skills as he was then transferred to the Gunnery Leaders Course at Sutton Bridge in Lincolnshire, with a commission. He also received the DFM for his tour of operations, with the citation particularly noting his part in a skirmish on a trip to Saarbrucken when five enemy fighters were attacked and driven off. After completing the Gunnery Leaders Course, Burcher was sent to 1654 Conversion Unit at Wigsley as an instructor. One of the pilots there was Mick Martin and according to Burcher’s account when Gibson telephoned Martin to ask him to join the new squadron he was told to bring Burcher along as well. As he knew Hopgood from 106 Squadron, he was placed in his crew. On the Dams Raid itself, Burcher, in the rear turret, could only hear what was going on in the front of the aircraft via the intercom. It would seem that when AJ-M was hit by flak some twenty minutes before the dam was reached, Burcher received superficial wounds to the leg and stomach. When Hopgood gave the order to bale out after the aircraft was hit again on the final attack, the wounded John Minchin managed to drag himself towards the rear escape hatch, with one leg almost severed. Burcher pushed his colleague out of the hatch first, pulling his parachute ripcord as he did so, and then followed him. Sadly, Minchin did not survive the drop, but Burcher did and he and John Fraser, who had escaped from the front of the aircraft, were captured separately and taken prisoner. On release from PoW camp in 1945, Burcher married Joan Barnes, a WAAF who had also served in 106 Squadron. They moved to Australia where Burcher continued service with the RAAF, and they had two daughters. At some point in the late 1940s his conduct became unsatisfactory and he suffered a number of health problems. His superiors speculated that some of this behaviour might have been caused by the effects of his wartime experiences. 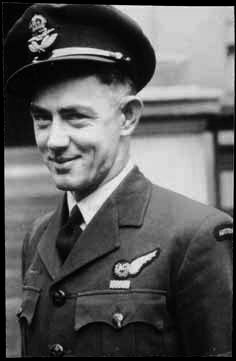 He was transferred to RAAF Overseas Headquarters in London in 1950, and was eventually discharged there in 1952, at the rank of Flight Lieutenant. He was repatriated to Australia at his own expense later that year. He eventually returned to the UK and worked in various businesses. In 1961 he was found guilty of being involved in a criminal fraud case, and was given a prison sentence. He then returned to Australia, and died in Hobart, Tasmania, on 9 August 1995. Survived war. Died 9 August 1995. Further information about Tony Burcher and the other 132 men who flew on the Dams Raid can be found in my book The Complete Dambusters, published by History Press in 2018.